The prices in this deal round up were accurate as of 2019-03-23 06:41 EST. The prices may have changed since then. 44% OFF Dash Mini Snowflake Waffle Maker: You can get this for only $9.99 here and it’s normally $17.99 at Kohls. 72% OFF Sunbeam Warm Steam Vaporizer Humidifier Filter-Free, 1388-800-001N: You can get this for only $6.88 here and it’s normally $24.99 at Amazon. 53% OFF Greenworks 8.5′ 40V Cordless Pole Saw, 2.0 AH Battery Included 20672: You can get this for only $106.46 here and it’s normally $229.00 at Amazon. 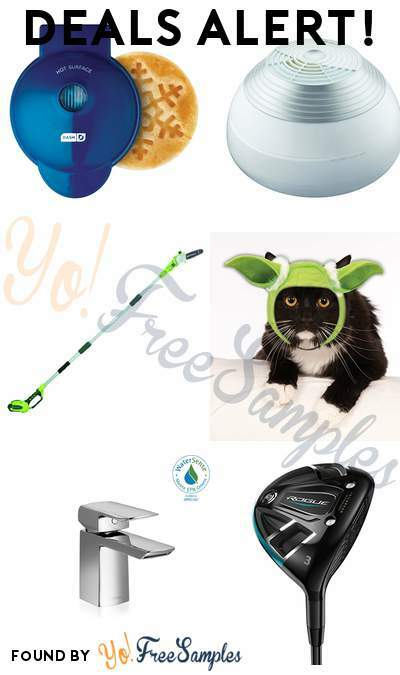 64% OFF Star Wars Pet Cat Yoda Ears: You can get this for only $2.95 here and it’s normally $8.25 at Amazon. 50% OFF TOTO Soiree Single Hole Single-Handle Bathroom Faucet in Polished Chrome: You can get this for only $189.44 here and it’s normally $378.88 at Home Depot. 42% OFF Callaway Golf 2018 Men’s Rogue Fairway Wood, Left Hand, Even Flow Blue, 70G Shaft, Stiff Flex, Heaven Wood, 20 Degrees: You can get this for only $142.77 here and it’s normally $249.99 at Amazon. 52% OFF Lansky 4-rod Turn Box Knife Sharpener: You can get this for only $10.42 here and it’s normally $21.99 at Amazon. 42% OFF Callaway Golf 2018 Men’s Rogue Fairway Wood, Left Hand, Synergy, 60G Shaft, Stiff Flex, Heaven Wood, 20 Degrees: You can get this for only $143.74 here and it’s normally $249.99 at Amazon. 54% OFF Funko Pop! Marvel: Captain Marvel – Talos Toy, Multicolor: You can get this for only $4.99 here and it’s normally $10.99 at Amazon. 80% OFF My Fairy Doorways – Woodland by Horizon Group USA: You can get this for only $4.99 here and it’s normally $24.99 at Amazon. 41% OFF Baxton Studio 39-1/2-Inch-Tall Leather Barstool, Set of 2, Espresso Brown: You can get this for only $236.18 here and it’s normally $403.00 at Amazon. 74% OFF Dust-Off DPSXLRCP Disposable Duster, 10 oz. : You can get this for only $41.93 here and it’s normally $161.89 at Amazon. 65% OFF Blanco 515824 16-Inch 1-3/4 Bowl Precision R10 Undermount Sink, Stainless Steel: You can get this for only $588.11 here and it’s normally $1,695.00 at Amazon. 46% OFF MSI Video Card Radeon RX Vega 56 Air Boost 8G OC: You can get this for only $349.99 here and it’s normally $649.99 at Amazon. 69% OFF ZAGG InvisibleShield Glass Screen Protector for iPad mini/ iPad mini 3: You can get this for only $13.59 here and it’s normally $44.99 at Amazon. 55% OFF Rubbermaid Slim Jim Glutton Recycling Station 4 Stream, 348 L – Blue: You can get this for only $546.79 here and it’s normally $1,225.82 at Amazon. 70% OFF Speck – Presidio Clear Case for Google Pixel 2 XL – Clear: You can get this for only $13.49 here and it’s normally $44.99 at Best Buy. 53% OFF Genuine Joe Lobby Dust Pan: You can get this for only $6.90 here and it’s normally $14.73 at Amazon. 41% OFF Safavieh Classic Collection CL762A Handmade Traditional Oriental Ivory Wool Oval Area Rug (4’6″ x 6’6″ Oval): You can get this for only $139.00 here and it’s normally $239.06 at Amazon. 43% OFF Channellock GLS-3 Griplock Plier 3-Piece Set : GL6, GL10, GL12: You can get this for only $28.99 here and it’s normally $51.76 at Amazon. 55% OFF CEQUENT CONSUMER PRODUCTS 2133111 9/1/4x4x3 Forged Draw Bar, 4.90″ Height, 3.12″ Width, 14.50″ Length: You can get this for only $16.14 here and it’s normally $35.99 at Amazon. 52% OFF Epson Premium Presentation Paper MATTE (8.5×11 Inches, Double-sided, 50 Sheets) (S041568): You can get this for only $7.19 here and it’s normally $14.99 at Amazon. 50% OFF SanDisk 32GB Ultra Dual Drive m3.0 for Android Devices and Computers – microUSB, USB 3.0 – SDDD3-032G-G46: You can get this for only $7.99 here and it’s normally $15.99 at Amazon. 50% OFF AUKEY Outdoor Speaker Bluetooth Waterproof, 30-Hour Playtime and Loud, Enhanced Bass and Treble for Apple, Samsung, and Other Devices: You can get this for only $39.99 here and it’s normally $79.99 at Amazon. 46% OFF Echo Dot (3rd Gen) bundle with Amazon Smart Plug – Sandstone: You can get this for only $39.99 here and it’s normally $74.98 at Amazon. 46% OFF KitchenAid KSMMGA Metal Food Grinder Attachment 2.5 lb. Silver: You can get this for only $70.00 here and it’s normally $129.99 at Amazon. 71% OFF Contigo Vaccuum-Insulated Shake & Go Fit Stainless Steel Shaker Bottle, 24 oz, Dusted Navy: You can get this for only $5.75 here and it’s normally $19.99 at Amazon. 43% OFF Insignia – 39” Class – LED – 1080p – Smart – HDTV – Fire TV Edition: You can get this for only $129.99 here and it’s normally $229.99 at Best Buy. 50% OFF Far Cry New Dawn – PlayStation 4: You can get this for only $19.99 here and it’s normally $39.99 at Best Buy. 81% OFF Call of Duty: WWII Valor Collection – Xbox One: You can get this for only $29.99 here and it’s normally $159.99 at Best Buy. 44% OFF Dell – S2319NX 23″ IPS LED FHD Monitor – Black/Silver: You can get this for only $99.99 here and it’s normally $179.99 at Best Buy. 50% OFF Pioneer – Bluetooth – In-Dash CD Receiver – Black: You can get this for only $54.99 here and it’s normally $109.99 at Best Buy. 50% OFF Modal – 3′ USB Type A-to-USB Type C Cable – Blue: You can get this for only $9.99 here and it’s normally $19.99 at Best Buy. 61% OFF SmilePowo 2 Pack NP-F970 Battery for Sony NP-F975, NP-F960, NP-F950, NP-F930, NP-F770, NP-F750, NP-F550, DCR, DSR, HDR, FDR, HVR, HVL and More: You can get this for only $38.99 here and it’s normally $99.99 at Amazon. 70% OFF Under Armour Men’s Performance Patterned Polo, Black /Black, Medium: You can get this for only $18.00 here and it’s normally $60.00 at Amazon. 45% OFF VIGRUE M6 Bolts Nuts Kit Hex Socket Head Cap Screws Nuts 114PCS for Crib Bunk Bed Furniture Cot, Barrel Bolt Nuts Hardware Replacement Kit with 2 Wrenches (M6×15mm – M6×75mm): You can get this for only $17.99 here and it’s normally $32.99 at Amazon. 68% OFF DampRid FG60FS Moisture Absorber, Fresh Scent, 10.5-Ounce, 2-Pack: You can get this for only $4.53 here and it’s normally $14.16 at Amazon. 43% OFF 2″ Swivel Caster Wheels with Safety Dual Locking and Polyurethane Foam No Noise Wheels, Heavy Duty – 150 Lbs Per Caster (Pack of 4): You can get this for only $16.99 here and it’s normally $29.99 at Amazon. 53% OFF Grand Theft Auto V – Xbox One: You can get this for only $14.00 here and it’s normally $29.99 at Amazon. 67% OFF Mainstays 40″ Fold-in-Half Plastic Folding Table, Rich Black: You can get this for only $29.44 here and it’s normally $89.44 at Walmart. 67% OFF Essentials by OFM ESS-6050 Ergonomic High-Back Leather Executive Office Chair, Black: You can get this for only $98.19 here and it’s normally $300.00 at Walmart. 44% OFF Hyper Tough 151-Piece Hand Tool Set, Metal Wall Cabinet: You can get this for only $49.99 here and it’s normally $89.97 at Walmart. 44% OFF Better Homes and Gardens Ombre Stripe Comforter Set, King: You can get this for only $38.20 here and it’s normally $69.00 at Walmart. 72% OFF K&H Pet Products Thermo-Mod Dream Pod Pet Bed, Small, 22″x22″x11.5″, Tan/Black: You can get this for only $37.74 here and it’s normally $137.99 at Walmart. 75% OFF Furinno 11189 Pasir 3-Tier Shelf with 3 Doors with Round Handle: You can get this for only $27.00 here and it’s normally $109.99 at Walmart. 67% OFF Essentials by OFM ESS-9015 Leather Executive Side Chair with Sled Base, Black, Reception Waiting Room Chair: You can get this for only $49.50 here and it’s normally $153.00 at Walmart. 42% OFF HP DeskJet 3632 All-in-One Wireless Printer/Copier/Scanner (F5S47A): You can get this for only $34.00 here and it’s normally $59.00 at Walmart. 45% OFF Intex 28405E Pure Spa 4-Person Home Inflatable Portable Heated Bubble Hot Tub: You can get this for only $349.00 here and it’s normally $638.99 at Walmart. 63% OFF Kenneth Cole New York Kenneth Cole Men’s Comfort-Fit Hoodie: You can get this for only $28.93 here and it’s normally $79.00 at Macys. 66% OFF Weatherproof Vintage Men’s Soft Touch Textured Sweater: You can get this for only $20.13 here and it’s normally $60.00 at Macys. 76% OFF INC International Concepts I.N.C. Men’s Classic Fit Rage Sweater, Created for Macy’s: You can get this for only $13.96 here and it’s normally $59.50 at Macys. 70% OFF Tag Legacy 4-Pc. Luggage Set: You can get this for only $89.99 here and it’s normally $300.00 at Macys. 55% OFF Handy Living ProLounger Sherwin Wall Hugger Recliner in Gray Microfiber: You can get this for only $300.00 here and it’s normally $668.00 at Macys. 80% OFF The Big One Down Alternative Reversible Comforter: You can get this for only $15.99 here and it’s normally $79.99 at Kohls. 89% OFF Men’s Croft & Barrow Slim-Fit Flannel Button-Down Shirt: You can get this for only $3.60 here and it’s normally $36.00 at Kohls. 70% OFF Men’s Nike Epic Knit Jacket: You can get this for only $16.50 here and it’s normally $55.00 at Kohls. 70% OFF Men’s Christmas Icons Blazer: You can get this for only $21.00 here and it’s normally $70.00 at Kohls. 70% OFF Dana Buchman Bella Tote: You can get this for only $20.70 here and it’s normally $69.00 at Kohls. 80% OFF Men’s New Balance Woven Softshell Jacket: You can get this for only $15.99 here and it’s normally $79.99 at Kohls. 90% OFF Men’s Dockers Classic-Fit Marled Quarter-Zip Sweater: You can get this for only $6.00 here and it’s normally $60.00 at Kohls. 80% OFF Men’s FILA SPORT Varsity Full-Zip Jacket: You can get this for only $10.00 here and it’s normally $50.00 at Kohls. 70% OFF Men’s Columbia Penns Creek Thermal Coil Hooded Parka: You can get this for only $66.00 here and it’s normally $220.00 at Kohls. 70% OFF Men’s Columbia Flattop Ridge Fleece Jacket: You can get this for only $18.00 here and it’s normally $60.00 at Kohls. 80% OFF Baby Boy Jumping Beans Zip Jacket: You can get this for only $3.20 here and it’s normally $16.00 at Kohls. 70% OFF Men’s adidas Essential Track Jacket: You can get this for only $18.00 here and it’s normally $60.00 at Kohls. 90% OFF Women’s Croft & Barrow Chenille Boatneck Sweater: You can get this for only $4.00 here and it’s normally $40.00 at Kohls. 46% OFF Men’s Apt. 9 Slim-Fit Easy-Care Dress Shirt: You can get this for only $16.99 here and it’s normally $32.00 at Kohls. 45% OFF Calphalon Electrics Auto-Speed Blender: You can get this for only $109.99 here and it’s normally $199.99 at Kohls.